The data was collected by phone on about 12,500 individuals age 15 or older. This was the first year they collected data on eldercare, that is, time spent providing unpaid care to someone over 65 "who needed help because of a condition related to aging." Almost 40 million people (39.8), 16% of the adult population, provided eldercare in the last 3 months. The majority of those (56%) were women. And when eldercare was provided, "persons spent an average of 3.1 hours providing this care." There's so much to talk about here, but one figure jumped out. How much time does the average American spend each day on "food preparation and cleanup?" A little over half an hour (0.56 hours). 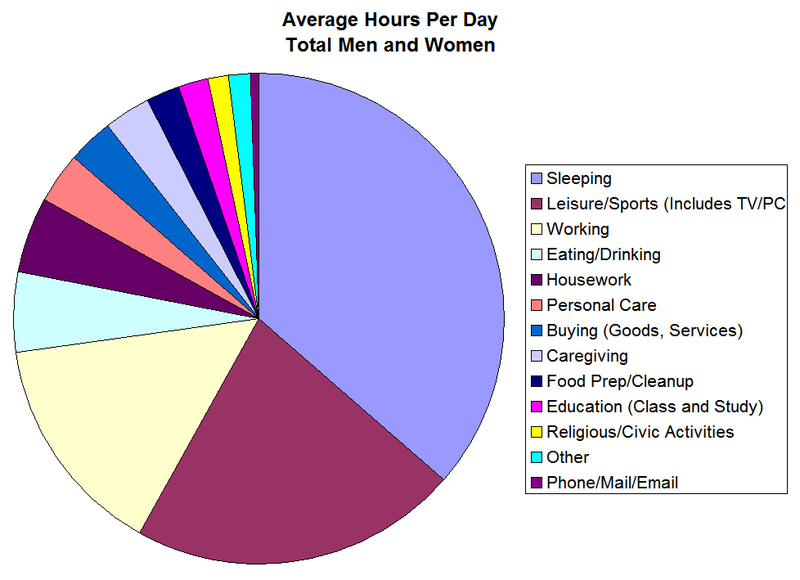 Women spent more time doing it than men (0.79 hours vs. 0.31 hours). But that's still an average; it blends together those who do no food prep with those that do. How many hours a day do people spend if they're the one doing it? ... a little over an hour (1.04). How much time do you spend in a day preparing food and cleaning up? I'm well over 2 hours. I spend about 3 hours a day, 30 minutes preparing breakfast, lunch, and dinner and 30 minutes cleaning up. Really less time in the morning and more time at night but it evens out. I don't know what I'd be eating if I spent 5 minutes preparing a meal and 5 minutes cleaning up. Maybe a bowl of cereal or a hot dog. Doesn't anybody cook anymore? I'm similar to you, Claudia, except most of my cooking time is in the early morning. I get up around 4:30 and usually put sweet potatoes in the oven and beans on the stove while I'm making lunches. Sure wish I slept 8.71 hrs a night! Re food, food prep takes up much more of my time than cooking. All the CSA stuff needs washing, chopping, steaming, sauteeing (or whatever), drying (as in dehydrator), bagging for freezing, fermenting, roasting, etc, so that it doesn't go bad before we actually use it in a meal. Once the prep work is done (which is usually one or two days a week), the cooking time is minimal by comparison. What foods do you dry, Melinda? I should use my dehydrator more. It doesn't work very well if the house is humid but ... I should try tomatoes. That CSA work is a doozy! Bix, if you have a basement, use the dehydrator there, so it doesn't heat up the living spaces of the house. I dry tomatoes, greens (kale, collards, chard, etc), summer squash, fennel bulbs, string beans, cucumbers (! ), peppers, eggplant, celery, beets, kohlrabi, winter squash.... I was driven to it last year when we ran out of freezer space. Some stuff can be just sliced & dried; other things need blanching first. I recommend a book by Phyllis Hobson, _Making and Using Dried Foods_. It's very thorough in explaining how to prep & dry foods, reconstitute, and use in recipes (which she provides). I would say 30 minutes is about right during the week for me. I'll grab a apple, banana, orange etc. for breakfast. Lunch, at work, is usually something like salad, frozen mixed veg, nuked carrots/potato/sweet potato, reheated beans. Nothing that requires much prep or time. Dinner is cooked by the wife. On the weekends it's not uncommon for that to go into hours each day. I need a wife, Shaun.